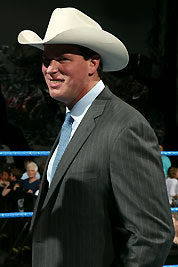 In the spring of 2005, JBL broke his top vertebrae in half, and suffered both a herniated and bulged disc in his lower back during a match in London, England. At the time of his injury, doctors told him there was nothing they could do for his herniated discs –- surgery would just aggravate them and make the damage irreparable. Recently, a non-surgical technique has been developed that is ubiquitous with professional sports teams for the treatment of herniated discs. "It's basically your modern day traction," said JBL. "The DRX9000 is the machine, and it's what all the pro teams are using. It's what everyone is going to for lower back injuries instead of surgery. I'm very skeptical, obviously, but the doctor said it's not going to just make my back get better, it's actually going to heal it." The tissue surrounding the spine that holds the discs in place is the annulus fibrosus. When the annulus tears, the discs slip out and put pressure on the spine. The spinal decompression treatment JBL is undergoing will actually stretch his spine through a series of systematic movements according to body weight and tension in the spine. The process will allow the discs to relax and sink back into place, at which point the annulus can heal around the discs. "Its uncomfortable and you get sore from it, but from what I understand, it's not that painful," said JBL. The injury resulted in a slew of health issues, from incontinence to numbness in his legs, and these issues ultimately forced him into retirement. "The symptoms that I had from nerve damage alarmed me to a great degree," JBL told WWE.com. "I mentioned that to Vince McMahon; he didn't know anything about it, and took me out of the ring immediately." JBL said it was disappointing to end his career at less than his best. Even though he tried to hide it, he couldn't do the things he wanted to do. "My body had deteriorated where I was almost a parody of myself," JBL admitted. "Looking back at those tapes, it makes me sick that I had gotten that out of shape and couldn't do the things I wanted to do. I couldn't workout, and it was everything I could do to get through the night. By the time I traveled to the show, I could barely walk. I couldn't even stretch to warm up," said JBL. "So I didn't leave the way I wanted to leave. I left on top which was great, but I don't want the last memory of me to live forever to be the fat guy that wrestled Rey Mysterio in Bakersfield, Calif."
JBL is feeling optimistic about the procedure, which has an 86 percent success rate with only a four percent rate of reocurrence. He began treatment yesterday, and will undergo it every day for the next six weeks. He already has plans for what he'd like to do when it's over. "Hopefully before I go play golf in the middle of April at St Andrew's, I'll be healthy enough to walk 18 holes," JBL said.